The radial velocity motion of WASP-128 due to its brown dwarf companion, folded on the best-fit period. The blue points correspond to RV measurements taken with CORALIE (circles) and HARPS (triangles). The solid line is the best-fit model. The residuals of the fit are shown in the lower panel. Credit: Hodzic et al., 2018. European astronomers have discovered a new transiting brown dwarf in a dynamical-tide regime as part of the Wide Angle Search for Planets (WASP) survey. The newly found object, designated WASP-128b, orbits its host on a close orbit—the measured stellar rotation rate places it in a regime where tidal interaction is dominated by dynamical tides. The finding is detailed in a paper published July 19 on arXiv.org. Brown dwarfs are intermediate objects between planets and stars. Astronomers generally agree that they are substellar objects occupying the mass range between 13 and 80 Jupiter masses. To date, most of discovered brown dwarfs were found to be solitary. However, some brown dwarfs orbit sun-like stars, and notably, up to 16 percent of such stars have companions more massive than Jupiter, of which fewer than 1 percent are brown dwarfs. Furthermore, only a handful of brown dwarfs were found to be orbiting G-type dwarfs. Such objects in G dwarf systems are thought to undergo rapid orbital decay due to runaway tidal dissipation. Expanding the list of known brown dwarfs in that kind of systems could be helpful in studying various substellar evolution models. Recently, a team of astronomers led by Vedad Hodzic of the University of f Birmingham, U.K., has detected a new brown dwarf in a close orbit around a G dwarf under the WASP program. 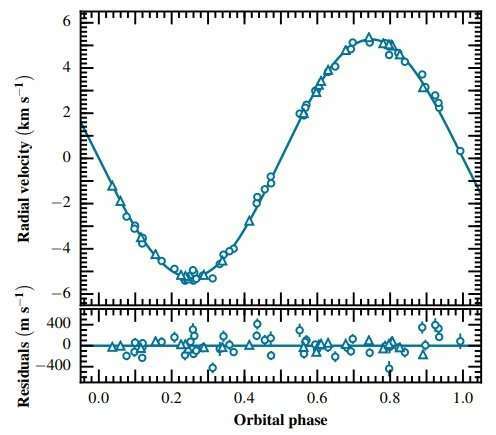 The transit signal in the light curve of the star WASP-128 was identified using the 0.6 m TRAPPIST robotic telescope and the 1.2 m Euler telescope, both located at ESO La Silla Observatory in Chile. Follow-up spectroscopic observations of this star confirmed that the signal was caused by a massive circumstellar companion orbiting the host. "We report the discovery of WASP-128b, a new transiting brown dwarf discovered by the WASP survey, orbiting a G0V host on a close orbit, where the measured stellar rotation rate places the system well-within the dynamical-tide regime, suggesting strong tidal coupling between the pair," the researchers wrote in the paper. WASP-128b is about the size of Jupiter (0.94 Jupiter radii) but 37.5 times more massive than our solar system's biggest planet. It orbits its parent star at a distance of approximately 0.036 AU, every 2.2 days. Moreover, the researchers found that WASP-128b is mildly inflated and also calculated that its remaining lifetime is about 267 million years. "While in the dynamically stable state, the infall time of WASP-128b is given by the magnetic braking timescale, and we derive a remaining lifetime of 267 Myr," the paper reads. The astronomers noted that this value is similar to that of some ultra-short period massive "hot Jupiter" exoplanets. The host, located about 1,375 light years away from the Earth, is some 16 percent larger and more massive than the sun. It has effective temperature of 5,950 K, an estimated age of about 2.3 billion years and a rotation period of around 2.93 days. As noted in the paper, such rotation rate is indicative of a tidal spin-up due to its massive companion. Massive companions in close orbits around G dwarfs are thought to undergo rapid orbital decay due to runaway tidal dissipation. We report here the discovery of WASP-128b, a brown dwarf discovered by the WASP survey transiting a G0V host on a 2.2d orbit, where the measured stellar rotation rate places the companion in a regime where tidal interaction is dominated by dynamical tides. Under the assumption of dynamical equilibrium, we derive a value of the stellar tidal quality factor logQ′⋆=6.96±0.19. A combined analysis of ground-based photometry and high-resolution spectroscopy reveals a mass and radius of the host, M⋆=1.16±0.04M⊙, R⋆=1.16±0.02R⊙, and for the companion, Mb=37.5±0.8MJup, Rb=0.94±0.02RJup, placing WASP-128b in the driest parts of the brown dwarf desert, and suggesting a mild inflation for its age. We estimate a remaining lifetime for WASP-128b similar to that of some ultra-short period massive hot Jupiters. And, in the blink of a cosmological eye, it will be gone. Presumably, progressive bake-off will erode it to a 'Hot Jupiter', then a 'metals' core, then 'metals' contamination of its host star. Do we have candidates for such ? A robust way to distinguish from 'primordial' cloud mix ?